Bicycles also caused problems for women in their corsets and long skirts, leading to the popularity of the tricycle. Conspicuous gentlemen, such as doctors and clergymen, also used tricycles because they were less dangerous and apparently more dignified. 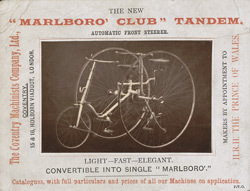 Tandem bicycles were built for two passengers, with the woman riding in the front.